One of the biggest adjustments I had to make when I moved to Ho Chi Minh City, Vietnam, after college was the idea that it is perfectly acceptable, expected even, to argue with a merchant about the price of their goods or services. It’s just a part of life. A part that makes a lot of Westerners kind of uncomfortable. After all, most bargaining is done over the equivalent of a pocketful of change. Whenever I translated my haggling into U.S. dollars, the whole process seemed almost obscene. “How much to Tan Dinh Market?” I asked a xe om (motorbike taxi) driver. I had been living in Vietnam for a few months, and was half decent at using Vietnamese for asking “how much” and then shooting down numbers. “94 cents,” he told me. I immediately rolled my eyes and groaned. “Too expensive! 63 cents,” I countered. 20 cents: the kind of change that would be too little to tip a bartender back home. But bargaining is commonplace around the world, especially in developing countries. And you should do it, no matter how silly/greedy/ashamed you feel about arguing over a few cents. There are a few good arguments for engaging in epic arguments over prices, though the most pragmatic one might be a simple case study in economics. Imagine you have a shop in a Vietnamese market selling eggs. You can sell a dozen eggs to a local (who knows what the price should be and won’t buy if it’s excessively costly) for 15,000 dong (94 cents). But a tourist, who doesn’t know any better, is willing to pay 30,000 dong ($1.88). Now, you have a fixed supply: your chickens can only lay so many eggs. To maximize profits, it’s in your best interest to sell exclusively to foreigners at the higher price. So the prices rise. Locals either can’t or won’t pay the asking price, but there are foreigners to buy the eggs. Your profits increase, but the local consumers don’t have any eggs. In a nutshell: not haggling artificially inflates prices and is bad for the local economy. 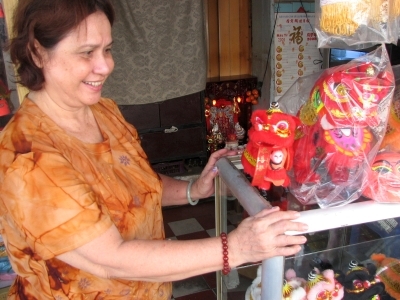 In Vietnam, there is no social taboo against asking directly how much something cost. This is cultural standard, and if you pay too much someone will tell you. Every time I came to work with a new bag/haircut/motorbike, someone asked me how much it cost. And every time it led to a full day of people approaching me to confirm the gossip, and then letting me know I had definitely paid too much. Not every price is negotiable. Many legitimate taxi companies will only charge metered fares, and it would be in poor taste to try and talk your waiter into giving you a better price at a restaurant. So when and where do you start haggling? A good rule of thumb is that if something has a price tag on it, the cost is non-negotiable. This includes restaurants, where prices are usually listed on menus or signs. Brick and mortar stores (as opposed to market stall) also typically have fixed prices. 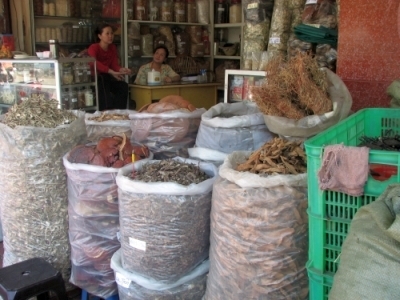 Binh Tay Market (Thap Moi Street) is the wholesale destination for everything from dried shrimp to toothpaste to soccer jerseys. Ben Thanh (Le Loi Street) is located smack in the middle of downtown and caters to the tourists that wander through. Saigon Square (near the intersection of Hai Ba Trung Street and Le Duan Street) has all the brand names you remember from home, with none of the quality. Still, if you want a Chanel handbag, this is your best bet. Dan Sinh Market (Yersin Street) is chock full of combat boots, Zippo lighters and canteens supposedly left over from the wars of the last century. 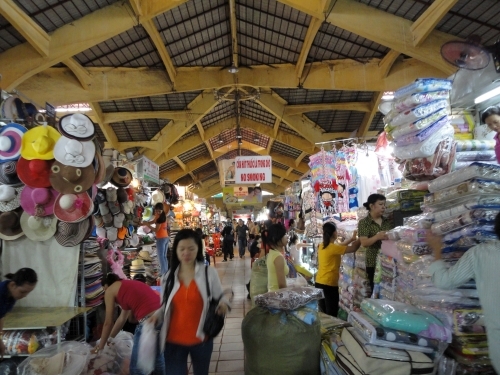 The first trick to haggling in Vietnam is to do it in Vietnamese. The price drops tremendously if the vendor thinks you live there. It indicates that you know what kind of prices you should be paying. If you are looking for something specific, ask a local what the going rate is before you head to the market. It helps to go into the negotiations with an idea of what you’re supposed to pay. Start haggling by quoting a price that is about 10-20% lower than what you think you should be paying. Work your way up from there. Feigning disinterest in the product and the price to the point where you simply leave it on the table can cause a merchant to reconsider their pucker point. This trick can backfire, however, if you walk away from something you want to buy more than the vendor wanted to sell it to you. You may have to return with your tail between your legs and pay the last price offered. There are no set-in-stone to follow when you haggle. Every situation is a little bit different and it’s important that you adapt. Some vendors will try to get every cent they can, while others will give you a great price right off the bat; try to play to your audience. Every time you haggle for something, you get a little better at it. Whether it’s learning to read the body language of a salesperson, improving your indignant cry of “too expensive!” or getting a better understanding of the going rates for pineapples, practice makes perfect. The last trick, and most successful strategy, is to not actually want what you are being sold. The less you want it, the better you are at bargaining. By far, my most successful attempt at bargaining was for something I didn’t want. It was a Sunday night market, and I was looking at some watches at a stall full of glittering sunglasses a faux Rolexes. I wasn’t so much looking to buy a watch as I was testing a theory that watches invariably look weird on my wrists. After trying a few on, I decided I was overly neurotic about the whole thing and started to leave. As I moved towards the street, the shopkeeper, a robust woman in matching Mickey Mouse pajamas, came over. She asked me if I like the watch, and I said yes but I didn’t want it. Not one to take no for an answer, she held it up to my face and asked how much I would pay for it. It seemed like I wouldn’t be getting out of there without going through all the motions, so I asked her the cost. 180,000 dong ($11.25) for the fake Rolex. It was too expensive, I told her as politely as I could. I turned to walk away. Problem solved. She grabbed my arm and asked again how much I would pay. Just to expedite my getting out of there, I gave a price that was so low she would have no choice but to kick me out. “70,000 dong,” I told her. About $4.37USD. She bargained herself. I pretty much had to buy it at that point. Besides, it served the purpose of heartily impressing my Vietnamese co-workers. Bargaining past half the original price was unheard of, even among locals. Too bad it broke within 24 hours of purchase. And too bad there are no warranties in Vietnamese markets. Whitney Cox is now living in Wellington, New Zealand, where she is slowly completing a post-graduate degree. She writes about traveling and living in New Zealand at FurtherThanYouThink.com.